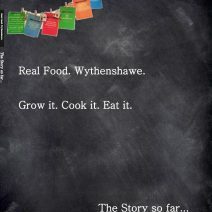 Real Food Wythenshawe is a 5 year lottery funded health & wellbeing project which set out to change the behaviour of local people around leading a more healthy sustainable lifestyle. Now coming to the end of it’s 5th year the team have produced a project evaluation to show what has been happening, what has been achieved and to present its findings. The team intentionally set out to make this evaluation interesting and exciting to read rather than traditionally full of facts and figures.